You can't beat mindful drawing for calming the mind, relaxation, self-care and inner peace - which are all things we tend to need in BIG doses after the whirlwind of the holiday season. Most of all, isn't it good to know as the dark days of January roll in in the Northern hemisphere, that you'll have something positive and uplifting to do every single day for a month? And if you're enjoying the Southern summer - you'll need to come in from the sun sometime! 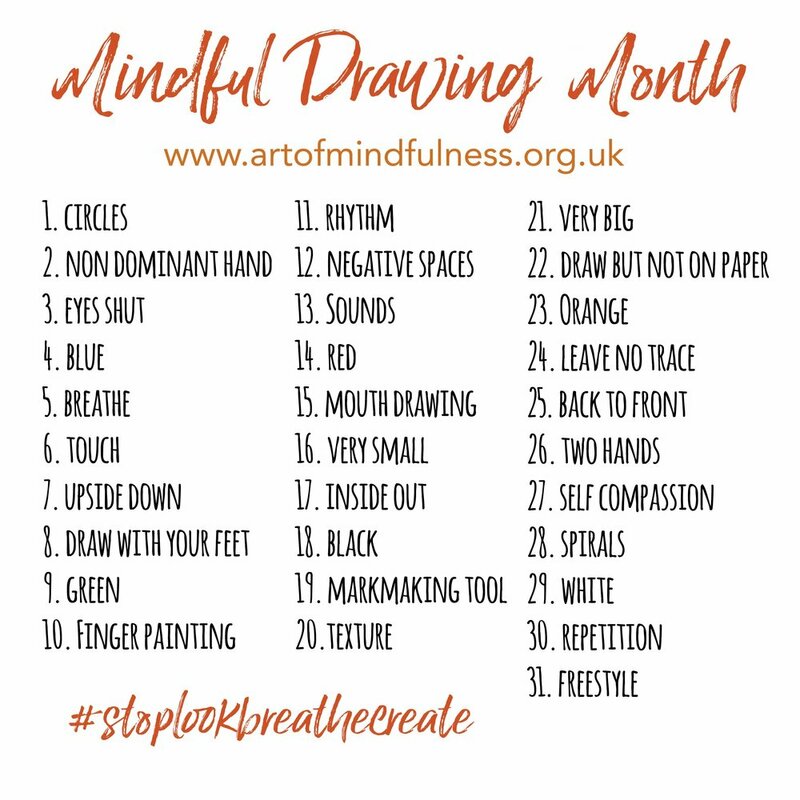 So for all these reasons, mindfulness, creativity, well-being, community and a boost through the dark months of the year, in January the Art of Mindfulness community have the opportunity to come together again for Mindful Drawing Month. In this way the whole Art of Mindfulness community can welcome new members and practice together, and you'll have a real feeling, that all around the world, other creative, mindful folk are practicing alongside you. 1) There are two mindful drawing practices which will support and deepen your practice. You can download them both as meditations from my Soundcloud below and use them on Day 1 and 5 of the challenge. 2) I'll also be offering pointers for practice when I post my own drawings each morning on Instagram and Facebook. So make sure you follow me in one of those places. 3) If you need more ideas then my Mindfulness and the Art of Drawing book has lots more meditations, exercises and practices as additional inspiration that you can feed in to the challenge. 4) Finally the #stoplookbreathecreate 3 Challenge, a FREE 3 week eCourse also contains a mindful drawing meditation and a short mindful drawing tutorial. You can sign up for this here. You can be as literal, imaginative, inventive and meditative as you want with these prompts. They're here simply to get you started. Where you go after that is entirely up to you. These prompts will work well for children too too. So if you've got a young family and they want to join in they can. You may want to work just with abstract mark-making or expressive and intuitive art, or you may want to draw the world around you. Or both. It's entirely up to you. You may want to concentrate on one medium (ink for example) or experiment with many different drawing media. Or you can do the whole thing in ball point pen on the backs of envelopes! Make a tool for mark-making. Use it. I'm inviting you to make this a real community event by posting your own daily practice on Instagram or Twitter using the #stoplookbreathecreate hashtag - or if that's a little too public for you, sharing in our private, friendly and supportive Stop Look Breathe Create Facebook Group. Here's the link for our lovely Facebook Group - it's a safe, friendly and encouraging space to share your creativity. Keep up to date with the Challenge via the Facebook Event Page here. Right click and save this reminder of all the Mindful Drawing Month prompts.